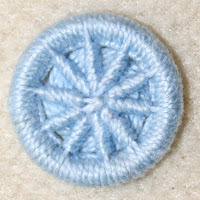 I’m Jen Best of BeakerButton and I make Dorset buttons for a living. 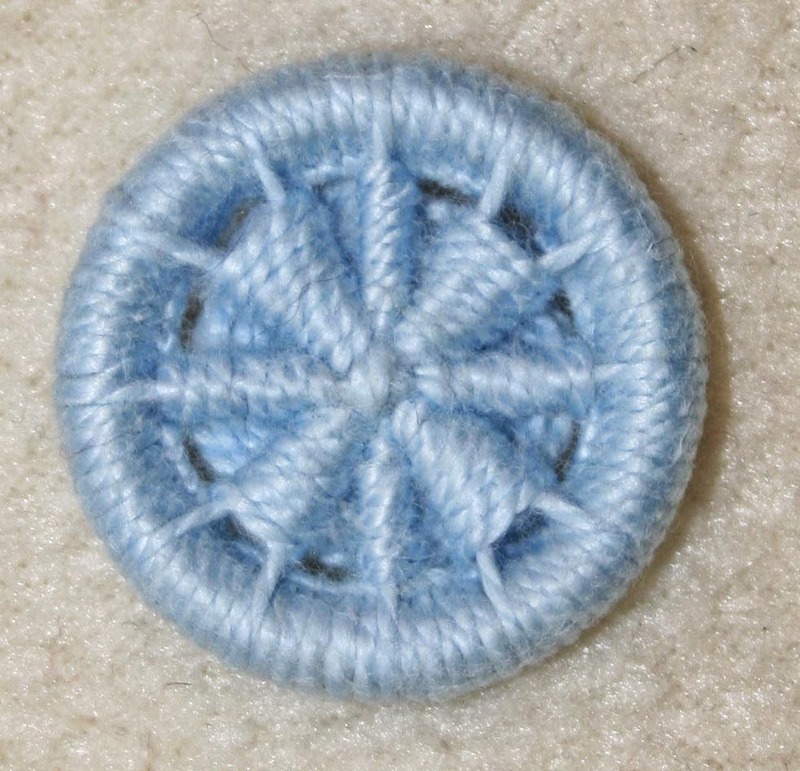 Most people I talk to haven’t heard of Dorset buttons, which is a real shame. Especially as at one time they provided a living for 4000 people and were sent all over the world. So I’m on a mission to make them world famous again. also known as the Blandford cartwheel. but there are many different patterns. I’ll explain a little more about how to change the pattern at the end. Instructions on how to make a Crosswheel button, sometimes known as a Blandford Cartwheel. 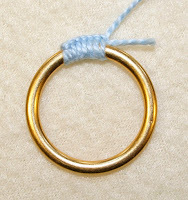 1 brass ring 2.6cm, approximately 2.5m of thread, blunt ended needle. 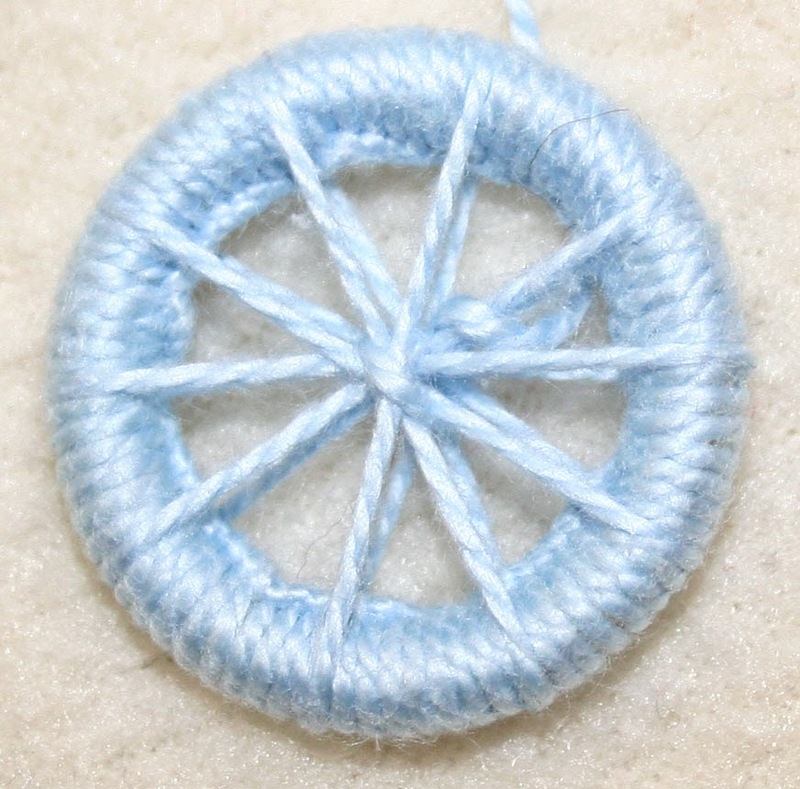 There are four stages to making a Dorset Button on a ring. 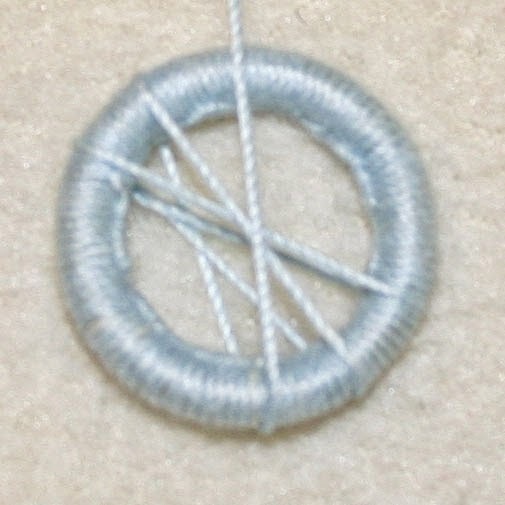 Casting, Slicking, Laying and Rounding. 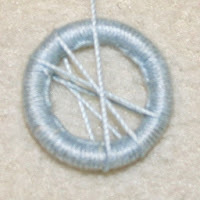 If you find you are running out of thread simply thread the tail of yarn neatly through the back of the button and leave a long tail. Add new yarn by threading it back the opposite way to the first thread, leaving a long tail, and continue rounding, stitching over the tails as well. The tails can be woven into the back of the button at the end. 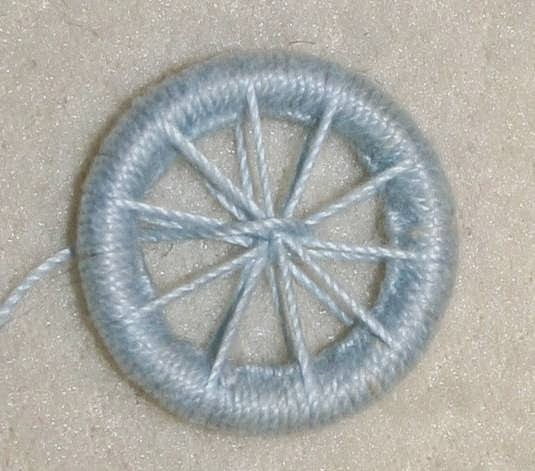 When laying the spokes make sure the spoke you are laying is perfectly in the centre of the ring at the front. Don’t worry about the back. This will help to make your spokes central. The holding stitches you put in will pull the back spokes into place. 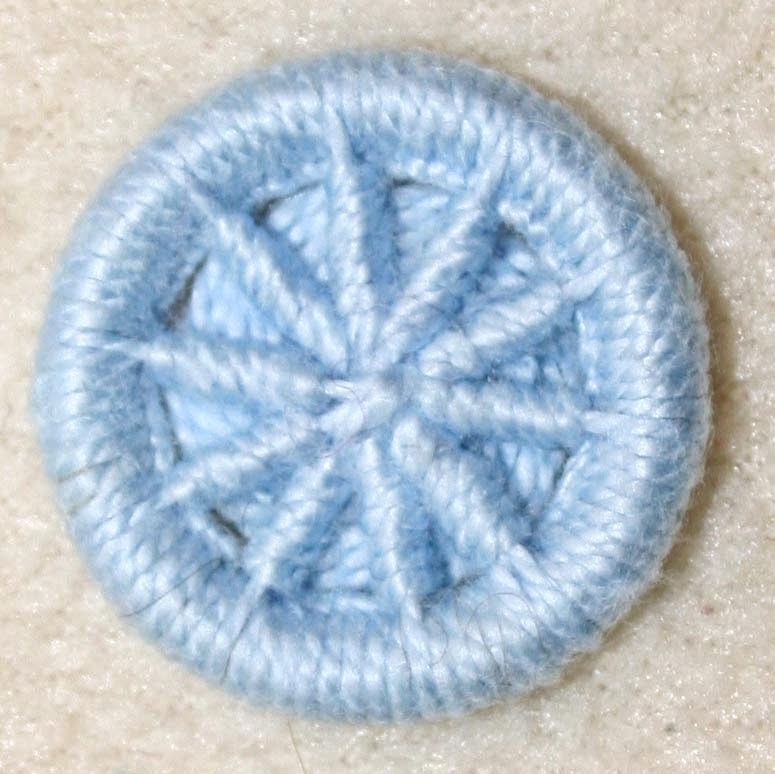 No Dorset button is 100% central, so don’t worry if yours aren’t. 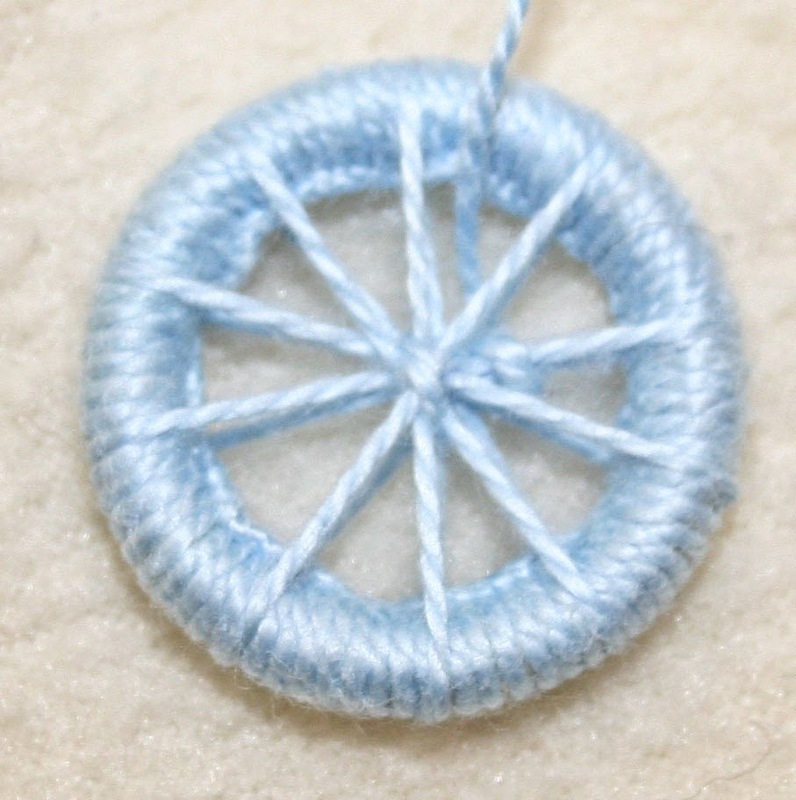 With practise they get more central, and if you find that the rounding stitches are filling up one side more push those stitches towards the middle. Thread the needle with the length of yarn. 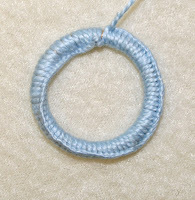 Tie the yarn round the ring in a single knot, leaving a tail of about 1-2cm. Stitch round the entire ring in blanket stitch, covering the tail as you go. Bring the needle towards you through the ring and pass it away from you through the loop created. 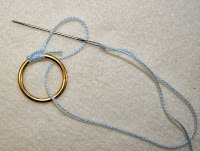 Make sure to cover the whole ring, moving the stitches along the ring so there are no gaps. 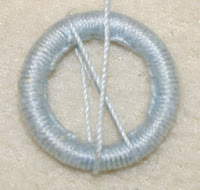 Turn all the stitches so that they face inwards, leaving a smooth edge to the button. 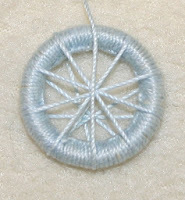 The thread should drop from the back of the button. 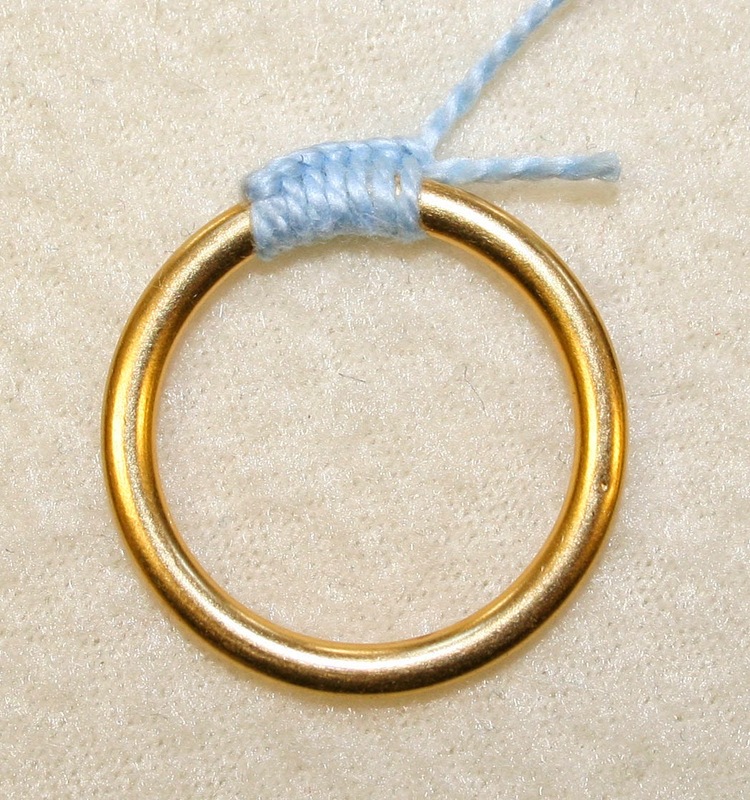 Bring the yarn towards you over the ring then back up. This forms one spoke. 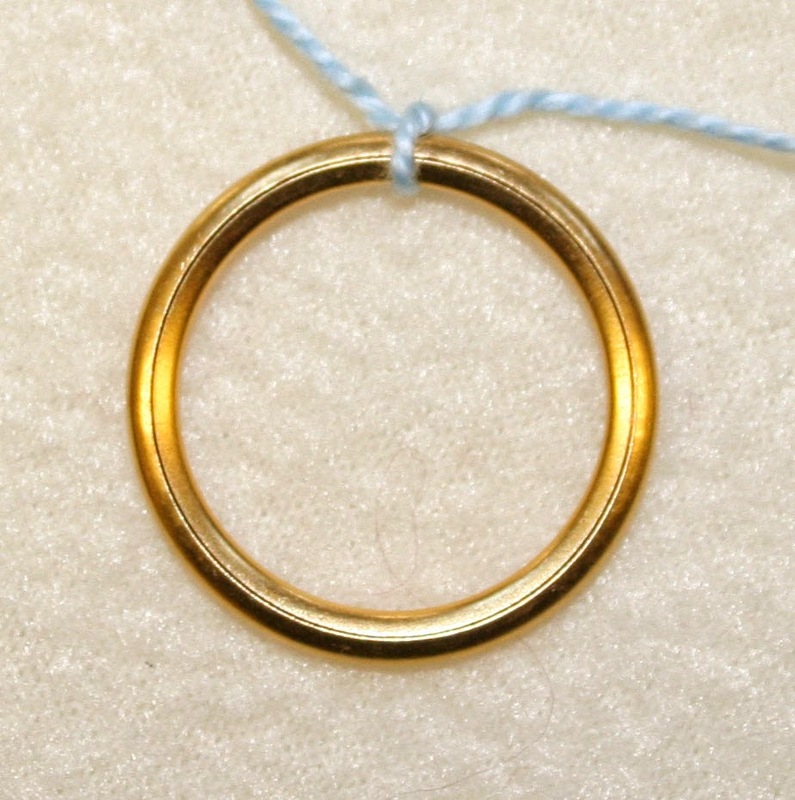 Turn the ring and repeat until there are several spokes around the ring. The spacing should be even. For a crosswheel button 10 spokes looks good. 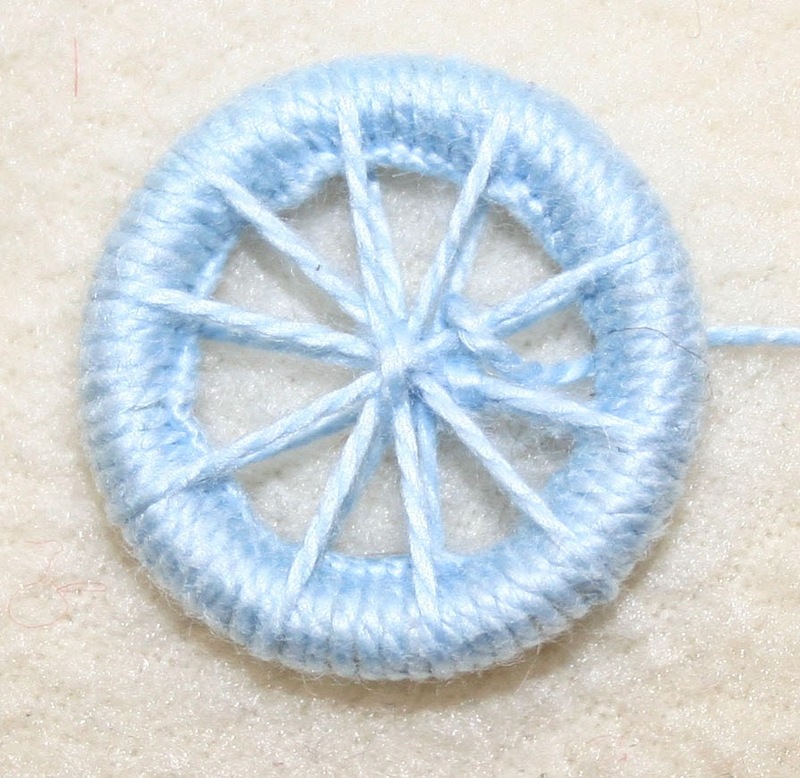 Make two or three stitches in the centre of the wheel to hold the spokes in place, being careful to catch all the threads from the back into the middle. 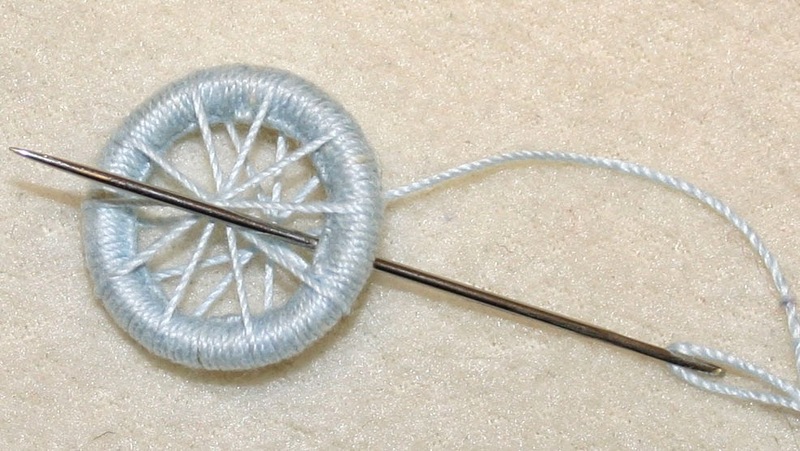 If you miss a thread put a third stitch in to catch the miss thread to the middle. I make my second stitch across my first, so they look like a cross. 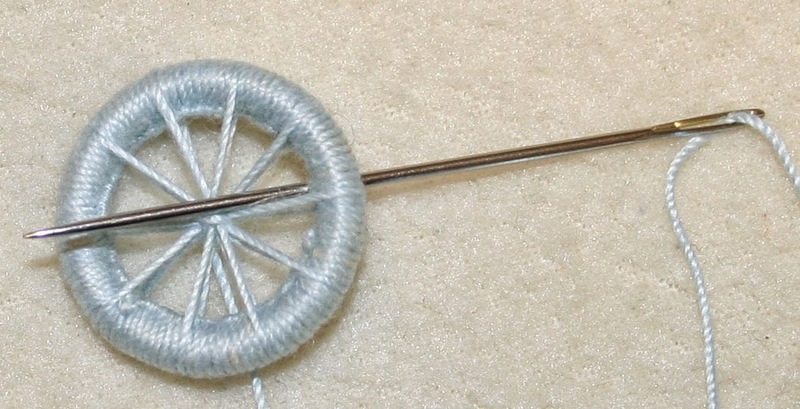 If your spokes are not central and you want them to be, firmly tug the middle until it’s placed centrally, using the side of the needle. Back stitch round the spokes. Bring the needle up from the back. Pass it back down clockwise over the spoke. 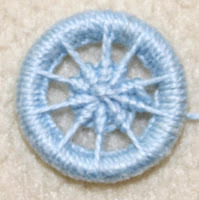 Bring it back up two spokes anti-clockwise. Pass it down one spoke clockwise. Repeat this until you reach the start of you first round. Continue back stitching rounds in this way until the entire button is filled. 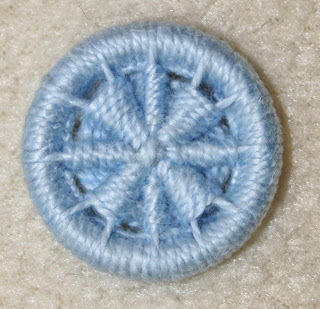 To make the button more central push the stitches closest to the edge into the middle with your finger, but leave the stitches furthest away. 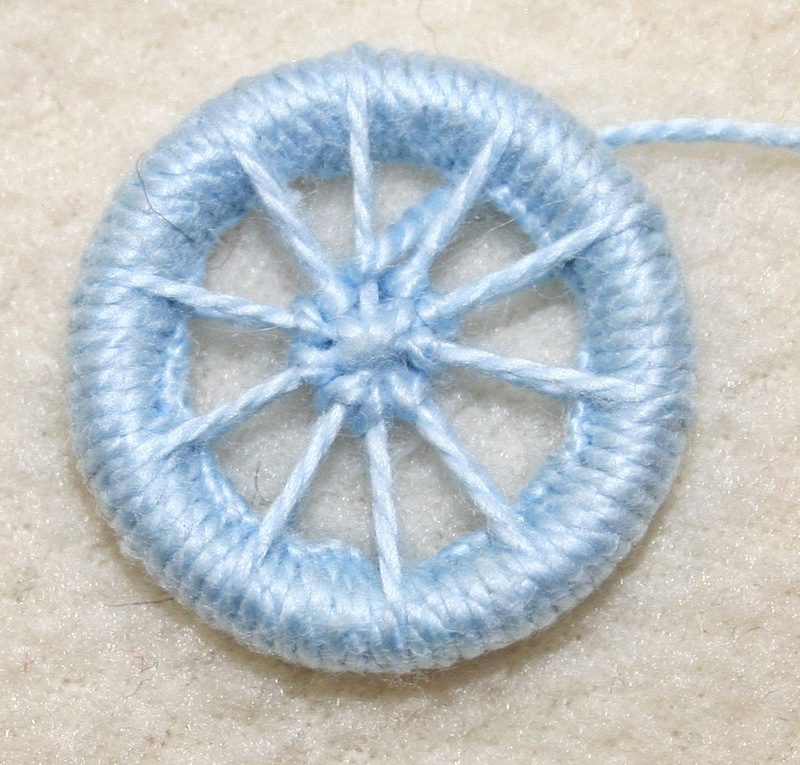 For different rounding patterns vary whether you stitch over one or two spokes at a time. For example the button below is very simple. You bring the needle over two spokes and under three, then over one and under three all the way round. You need to have twelve spokes for this pattern to work. 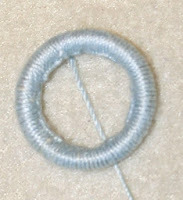 Thread the tail of the yarn at the back of the button into the middle and make one or two holding stitches. 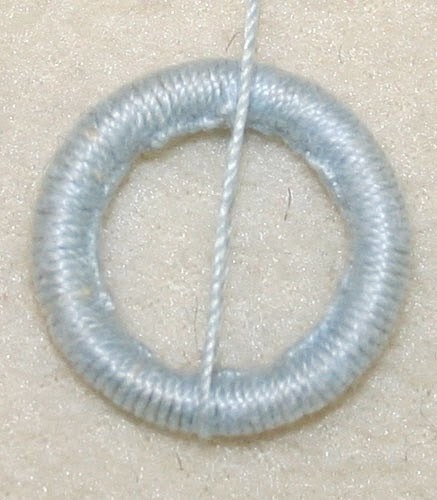 Leave the yarn tail for sewing onto a garment. So that’s it. 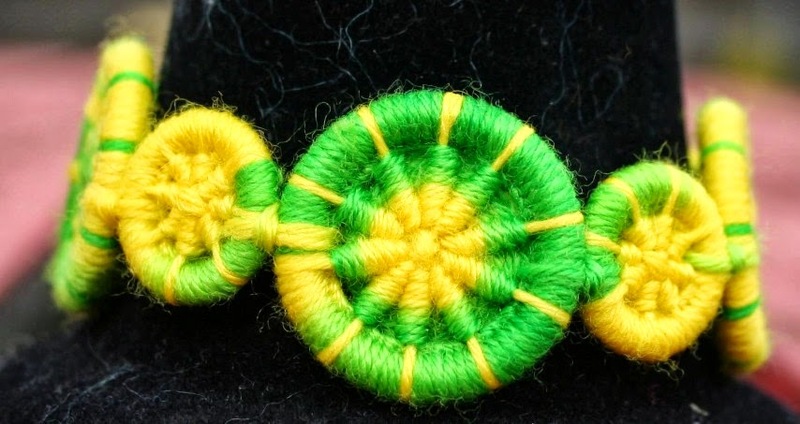 How to make a Dorset button. Try making them with different thread and on different sized rings. 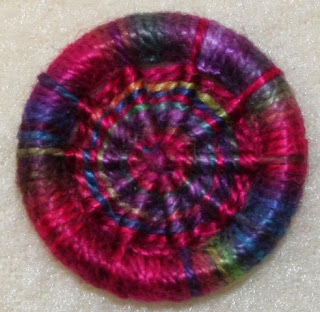 I love using sock wool as it’s colourful, strong and has great stitch definition. I make my buttons into jewellery, accessorise bags with them, use them as eyes on stuffed toys, and of course fasten clothing with them. I hope you’ve enjoyed my tutorial. Thank you ever so much for showing us how to make them. Thank you for your wonderful comments I will let Jen know.